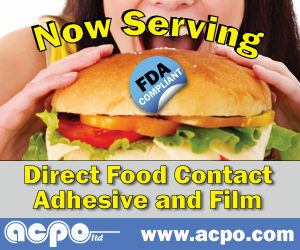 acpo, ltd. has added 531FDA to their line of self-wound overlaminate films. In addition to 505FDA and 615FDA, 531FDA complements the family of products which are all compliant for direct food contact – both adhesive and film. This matte film features a soft non-glare finish and is receptive to some pen, pencil and marker. The 531FDA film meets requirements for direct contact per 21 CFR 177.1520. 531FDA adhesive is compliant with 21 CFR 175.105 for incidental/indirect edge or seam contact and direct adhesive contact according to 21 CFR 175.125. Made in America, acpo remains your trusted source for FDA overlaminate needs. This entry was posted in Announcement, News on May 22, 2018 by Tammy Calhoun.